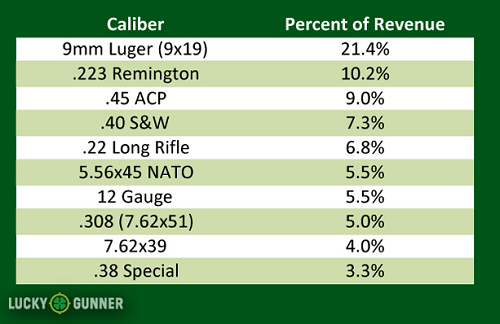 What Are The Most Popular Firearm Calibers? I’m sure many of you remember why there were so many guns sold between 2008 and 2014. Between Obama’s reelection and the threats of confiscation after Sandy Hook, there was a genuine fear for our right to bear arms. Even now, that fear wouldn’t be unwarranted. But back then it almost seemed like a panic. Guns were flying off the shelves and so much ammo was being sold that the police were having trouble maintaining their regular supplies. And it wasn’t just the most popular weapons that were being sold out, like the AR-15. The prices for every kind of firearm were going up. Even cheap guns like the Mosin Nagant are currently selling for more than two hundred dollars, when just a couple of years ago you could buy one for 80 bucks before taxes and processing fees. Keep in mind, this is not a great gun. I know because I own one. Heavy trigger, sticky bolt, moderate accuracy, weighs a ton, and kicks like a mule. The only redeeming qualities are its durability and price. And yet, people were so concerned about the future that they felt the need to stock up anything they could a get hold of, including Mosin Nagants of all things. Think about it. These people were concerned about gun confiscation, martial law, and or social collapse, and yet they were buying guns that weren’t necessarily well suited for a cataclysmic scenario. Fear tends to do that to people. We start thinking the sky is going to fall tomorrow and we have to scramble for whatever we can get a hold of right now, as in right freaking now guys! Then we end up buying sub par tools at peak prices. But hey, there’s less panic now, and I think we can all take a look at our gun collections (yes, some of them are massive collections now) and ask ourselves, will these really help us survive? If you’re looking for a good firearm for prepping, I think the most important factor to consider is the caliber of the gun. And I’m not talking about stopping power or accuracy. How many people bought a Mosin because it was the only thing they could afford, even though during any long-term emergency that ammo would be almost impossible to find? I mean sure, there’s still a lot of Soviet stuff still lying around that you can grab for a low price, but if you ran out during a situation where you couldn’t just go online and buy more bullets (like I don’t know, if the government made your gun illegal, i.e. the biggest reason people were buying more guns) where would you ever find more? I know, my Mosin is becoming a tired example, but the point is if we’re trying to prepare for a world that lacks the sophisticated system of global logistics that we know and love today, then we shouldn’t buy overpriced guns in niche calibers that would be hard to come by. I decided to do some research on what the most common bullet calibers are, and it was surprisingly difficult to find official statistics. If you happen to have any links to those numbers, feel free to post them in the comments. Based on personal experience I have a basic idea of which bullets are the most abundant. However, I’ve had a hard time seeking out evidence that was more than anecdotal. The only thing I did find was a few statistics provided by Luckygunner.com that reflects their most profitable munitions from 2013. This site specializes in selling bulk purchases of ammunition, so this should give you a good idea of what calibers will be fairly abundant after a severe breakdown of society. These are the calibers that many gun owners have decided to stock up on, in many cases by buying more ammo then they’ll ever use. And here’s an even more specific breakdown. So there you have it. If you bought a gun in a rare caliber several years ago because you were scared of what the future may bring, and it was the only thing you could find/afford, maybe now is a good time to rethink that purchase. I’d suggest you sell it, and put the money towards something with a more abundant caliber. 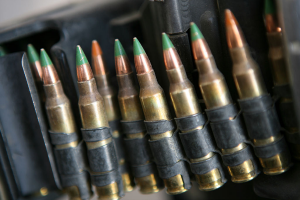 Should you ever run low on the ammunition you need during an emergency, for any reason, you’ll be glad you did. This entry was posted in Security by paadmin.Bookmark the permalink.